It is commonly known that dental treatment can be quite nerve-wracking and anxious for many individuals. For this reason, it is highly encouraged to bring your children in at an early age to ensure they are accustomed and familiarised with the dental environment. Rest assured that our dentists at Emerald Dental Care will aim to provide a comfortable and friendly experience for your children, in a stress-free environment. We recommend routine 6 monthly dental visits for young children, starting at 12 months of age. This will allow them to familiarise with the dental surroundings and to allow them to feel at ease at future appointments. At each check-up appointment our dentists will perform a thorough examination, checking all the baby teeth (and adult teeth if any) and gums, as well as removal of plaque build-up. It is important to ensure that the baby teeth are healthy, and are not lost too early due to decay or cavities. If baby teeth are lost prematurely, the spaces may start to close, potentially causing issues for the adult teeth coming through. The development and position of the teeth will also be assessed for the need of early interceptive orthodontic treatment. We accept the Medicare Child Dental Benefits Schedule claims at Emerald Dental Care. 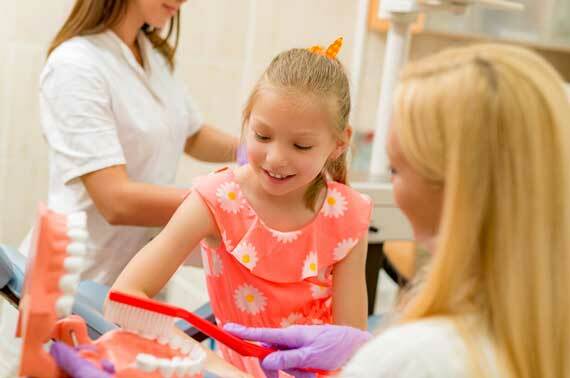 General treatments like Children’s Dental Check-Up and Clean are covered as part of CDBS. With Medicare CDBS you can claim up to $1000 in FREE Dental Care for your child, click here to learn more about CDBS. Call us at Emerald Dental Care today on (03) 8768 8466 to schedule an appointment to start your smiling journey!